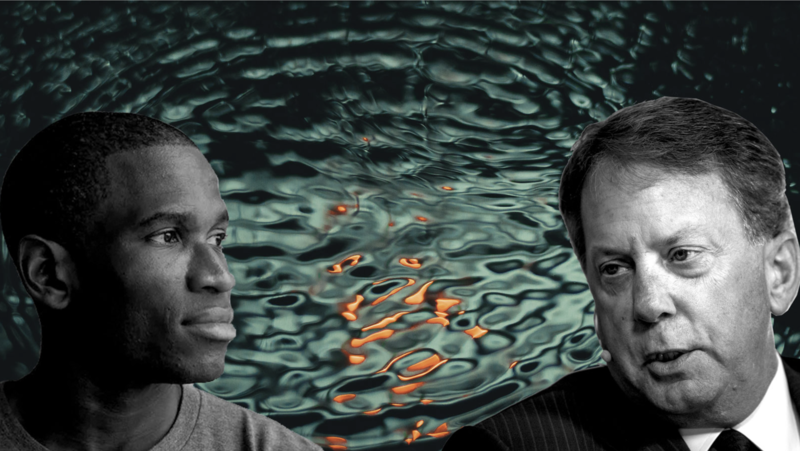 Abstract: On 18th April 2019, the BitMEX Research Bitcoin Cash SV node experienced 2 block re-organisations. First a 3 block re-organisation, followed by a 6 block re-organisation. In this brief piece, we provide data and graphics related to the temporary chainsplit. The chainsplit appears to be caused by large blocks which took too long to propagate, rather than consensus related issues. 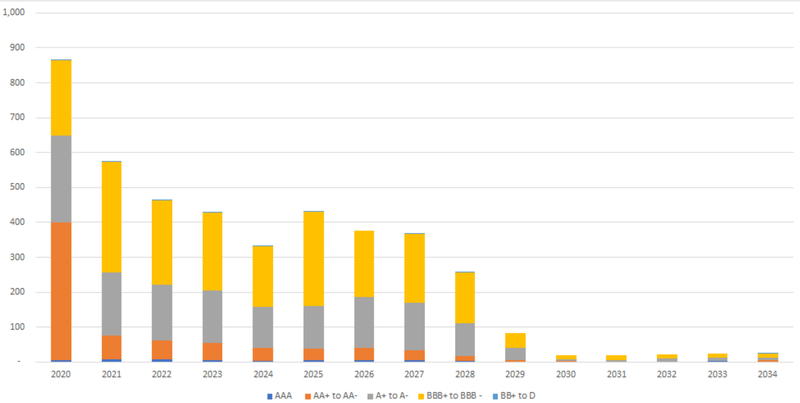 Our analysis shows there were no double spends related to the split. Notes: The above image indicates there were two valid competing chains and a non-consensus split occurred at block 578,639. 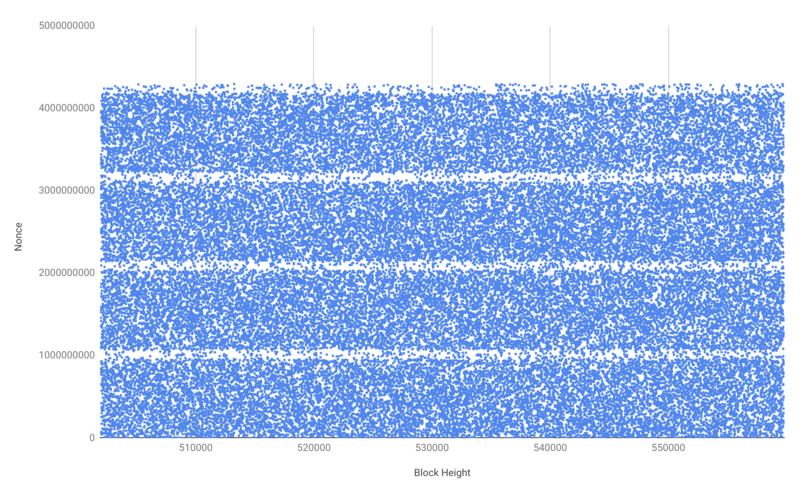 Our node followed the chain on the left until block 578,642, then it jumped over to the right. About an hour later, it jumped back over to the left hand side. The chain on the left continued, while the chain on the right was eventually abandoned. 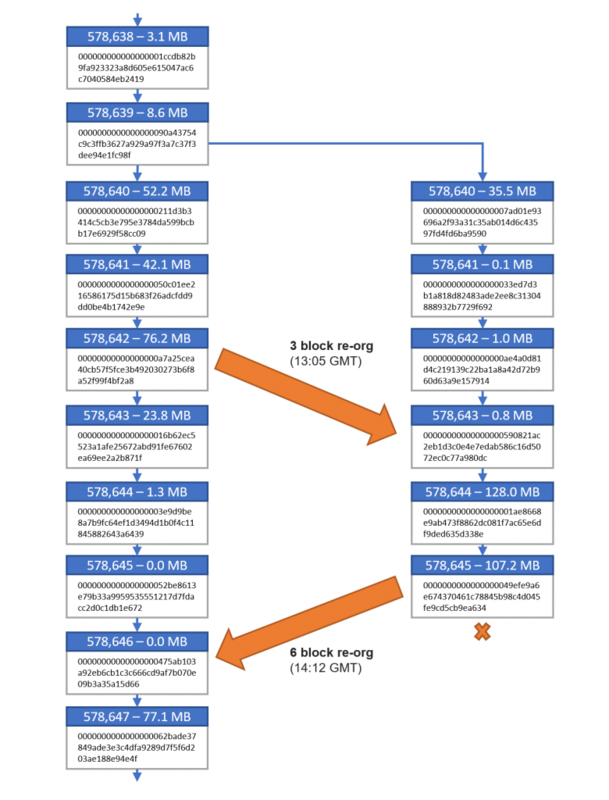 Based on our analysis of the transactions, all the TXIDs from the forked chain (on the right), eventually made it back into the main chain, with the obvious exception of the coinbase transactions. Therefore, it is our belief that no double spends occurred in relation to this incident. With the above details one can follow what occurred in relation to the chainsplit and create a timeline. Our primary motivation for providing this information and analysis is not driven by an interest in Bitcoin Cash SV, but instead a desire to develop systems to analyse and detect these type of events on the Bitcoin network. Systems are being developed on our website, https://forkmonitor.info, to help detect chainsplits, caused either by poor block propagation or consensus related issues. This event on Bitcoin Cash SV is good practice for us. 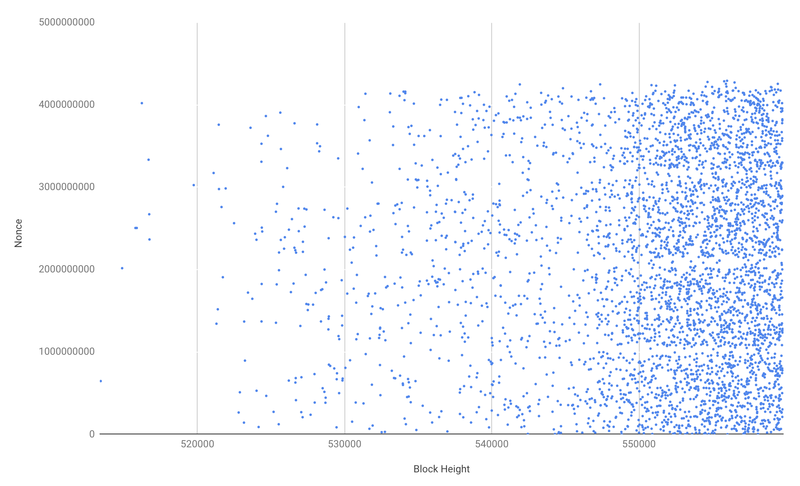 As for Bitcoin Cash SV, the block sizes were particularly large during the period of the re-organisations. 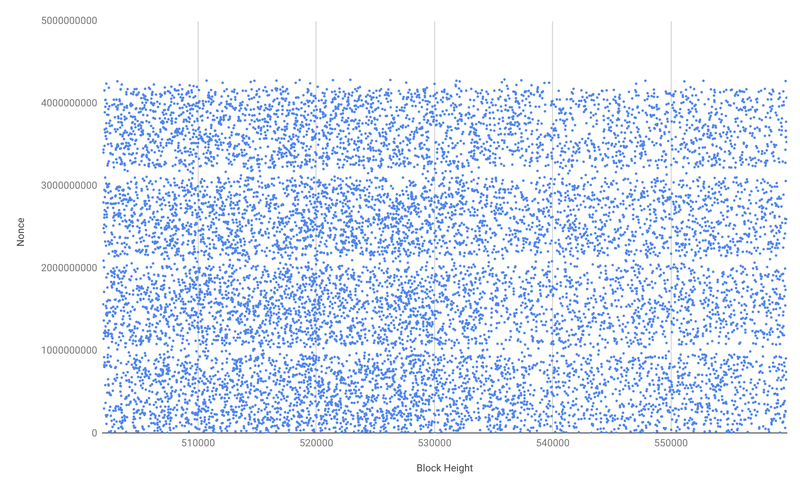 On the forked chain, the last two blocks were 128MB and 107MB respectively. 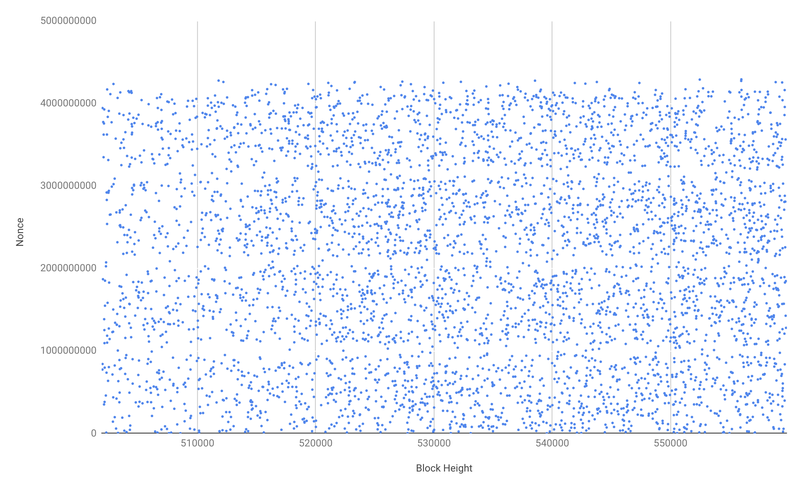 On the main chain many of the blocks were over 50MB. Therefore, in our view, it is likely the large sizes of the blocks were the root cause of the re-organisations, as miners couldn’t propagate and verify these large blocks fast enough, before other blocks on different chains were found. As for the implications this has on Bitcoin Cash SV, we have no comment. We will leave that to others. Abstract: BitMEX Research examines the market dynamics of Lightning network routing fees and the financial incentives for Lightning node operators to provide liquidity. We identify the interrelationship and balance between Lightning routing fees and investment returns for channel liquidity providers, as a major challenge for the network, rather than the computer science aspects of the routing problem. We conclude that if the Lightning network scales, at least in theory, conditions in wider financial markets, such as changing interest rates and investor sentiment may impact the market for Lightning network fees. However, regardless of the prevailing economic conditions, we are of the view that in the long term, competition will be the key driver of prices. 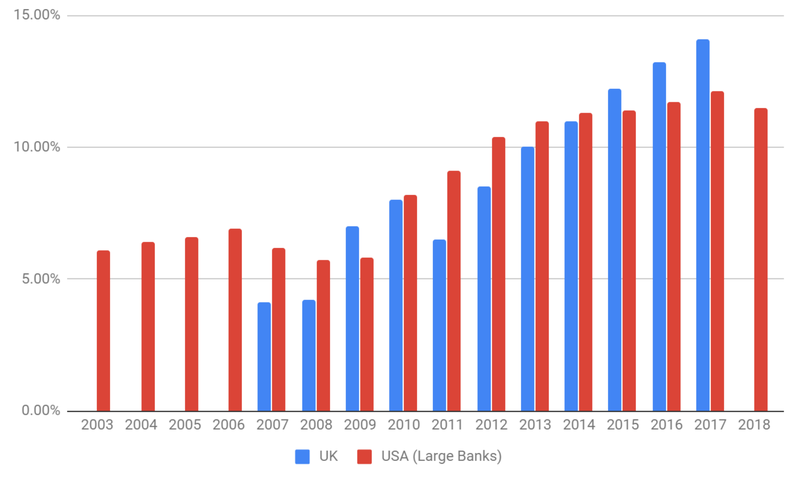 Low barriers to entry into the market could mean the balance favours users and low fees, rather than investment returns for liquidity providers. 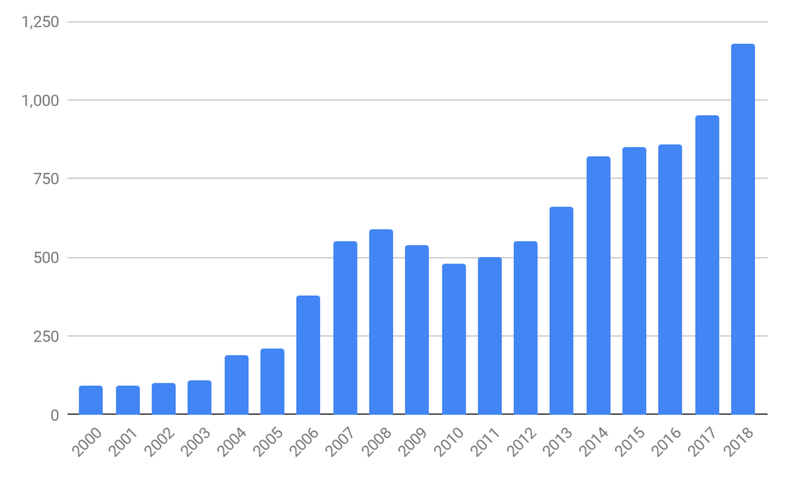 We first wrote about the Lightning network back in January 2018, when it was mostly theoretical. Today, as the Lightning network transitions from abstract to experimental, we felt it was time to take another look. The primary focus of this report is to analyse the Lightning network from a financial and investment perspective, notably with respect to fees and the incentives for Lightning network providers. We will not examine other aspects of the technology. 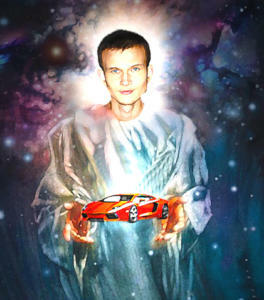 Critics of the Lightning network often point to routing as a major problem, typically making claims like its “an unsolved problem in computer science”. In general, we do not really agree with this characterization of the routing problem and do not see the computer science of routing to be a major challenge, finding paths between channels to make payments may be relatively straightforward and similar to other P2P networks, such as Bitcoin. However, what we do think its a major challenge is the interaction or balance between the financial and economic aspects of liquidity provision and payment routing. Lightning network node operators need to be incentivised by routing fees to provide sufficient liquidity, such that payments can be made smoothly. Liquidity needs to be allocated specifically to the channels where there is demand and identifying these channels may be challenging, especially when new merchants enter the network. This balance between ensuring the network has low fees for users, while also ensuring fees are high enough to incentivise liquidity providers, is likely to be a significant issue. 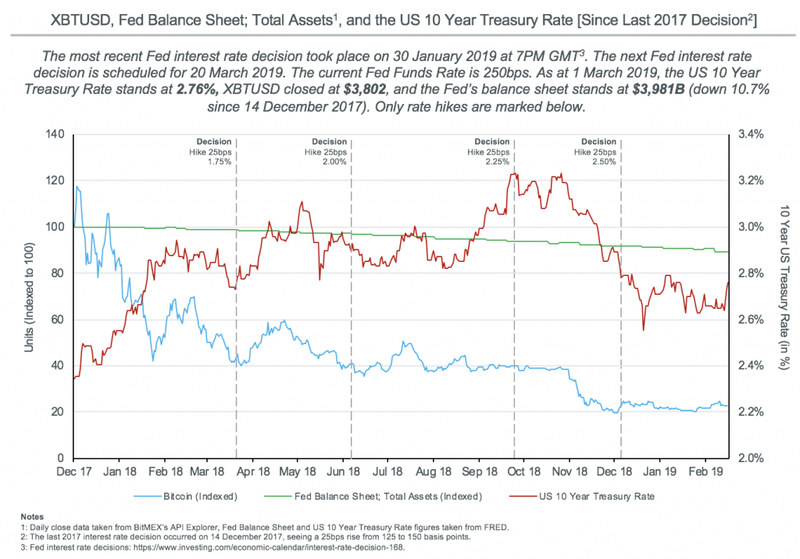 As we explain further in this article, the magnitude of this problem and the fee rates at which the market clears, may depend on economic conditions. For onchain Bitcoin transactions, users (or their wallets) specify the fee for each transaction when making a payment and then miners attempt to produce blocks by selecting higher fee transactions per unit block weight, in order to maximise fee revenue. In contrast, Lightning currently appears to work the other way around, routing node operators set the fee and then users select a path for their payment, selecting channels in order to minimise fees. With Lightning, suppliers initially set fees rather than users. Lightning may therefore offer a superior fee architecture, as suppliers are providing a specialised service and it is more suitable that suppliers compete with each other over fee rates, rather than ordinary users, where the priority should be on simplicity. In Lightning there are two types of routing fees node operators must specify, a base fee and a fee rate. Base fee A fixed fee charged each time a payment is routed through the channel This is expressed in thousandths of a Satoshi. For example a base fee of 1,000 is 1 satoshi per transaction. 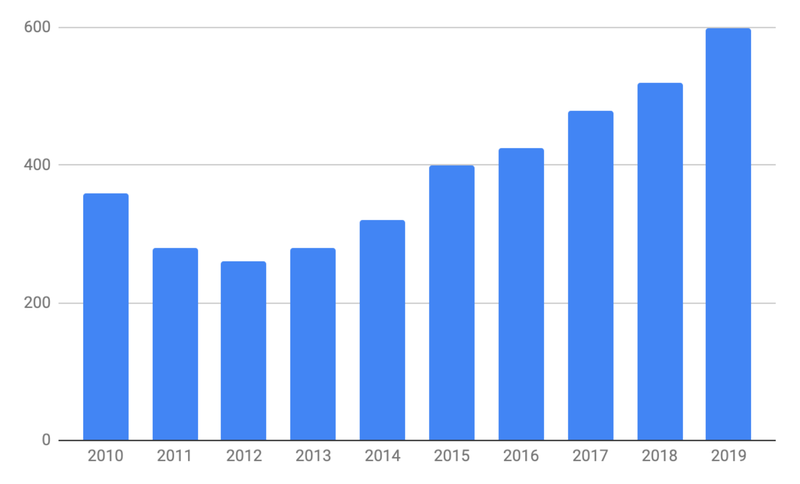 Fee rate A percentage fee charged on the value of the payment This is expressed in millionths of a Satoshi transferred. For example a fee rate of 1,000 is, 1,000/1,000,000, which is 0.1% of the value transferred through the channel. Equivalent to 10bps. In order to provide liquidity for routing payments and to earn fee income, Lightning node operators need to lock up capital (Bitcoin) inside payment channels. Inbound capacity Inbound liquidity, are funds inside the node’s payment channels which can be used to receive incoming payments. These funds are owned by other participants in the Lightning network. Outbound capacity Outbound liquidity, are funds inside the node’s payment channels which can be used to make outbound payments. These funds are owned by the node operator and part of their investment capital. The node operator may consider the opportunity costs of other investments, while considering the total outbound balance. 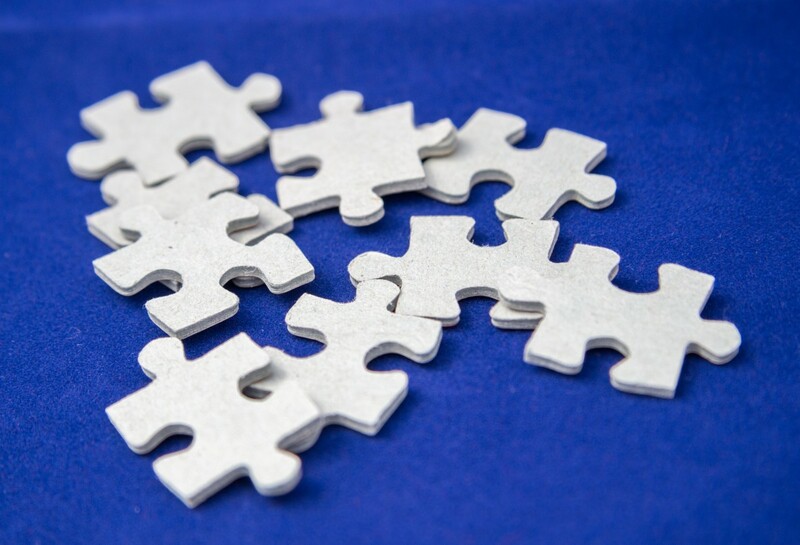 Becoming a successful routing node is harder than one may think. 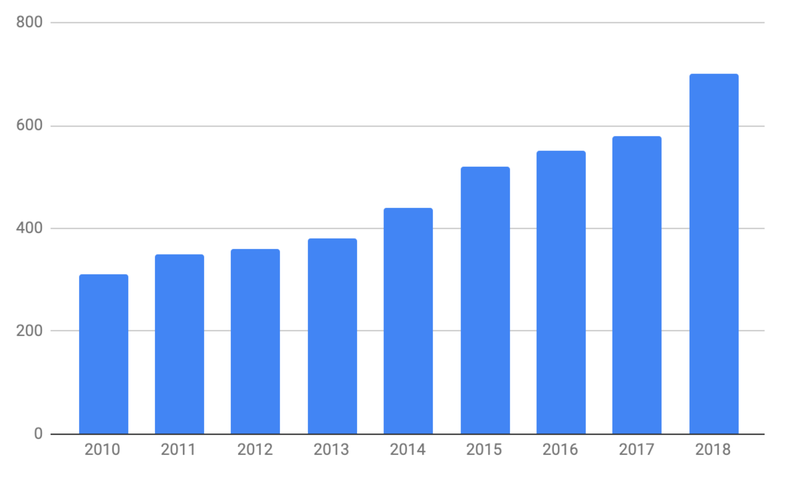 At the time of writing, according to 1ml.com, there are 7,615 public Lightning nodes. However, it is likely that only a few hundred of these nodes are doing a good job providing liquidity, by managing the node, rebalancing channels and setting fees in an appropriate manner. Currently, there are no automated systems capable of doing the above functions. If this does not change, specialist businesses may need to be setup to provide liquidity for the Lightning network. However, just as with liquidity, the challenges in overcoming these technical issues do not necessarily mean payments will become difficult or expensive. 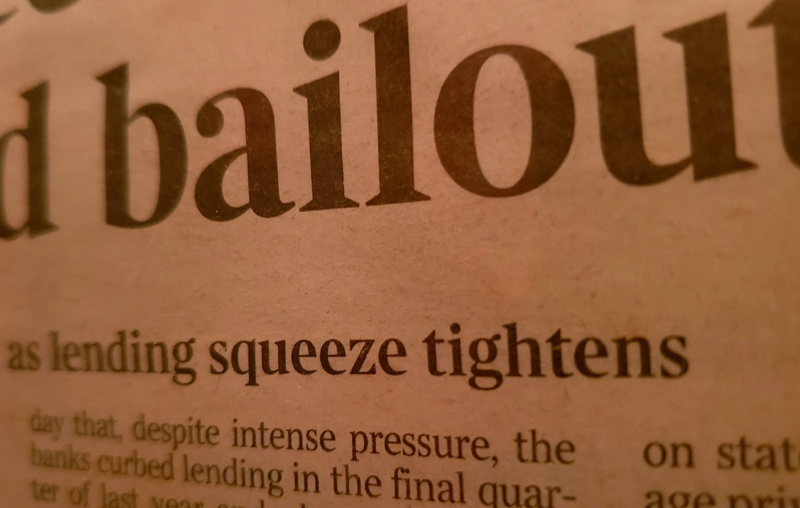 These technical challenges may simply adjust the equilibrium market fee rate. The more difficult these problems are to overcome, the higher the potential investment returns will be to channel operators and the greater the incentive will be to fix the problems. It will be demand that drives Lightning’s success, not the challenges for node operators. In order for Lightning fee markets to work, node operators may need to adjust fees based on the competitive landscape, this could be based on algorithms or be a manual process, aimed at maximising fee income. 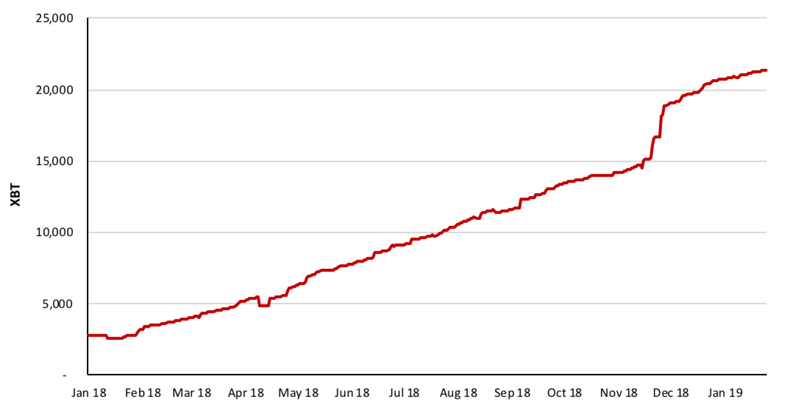 In an attempt to emulate what may eventually become standard practise, BitMEX Research experimented with modifying the fee rate on one of our nodes over a three month period, as the below section reveals. 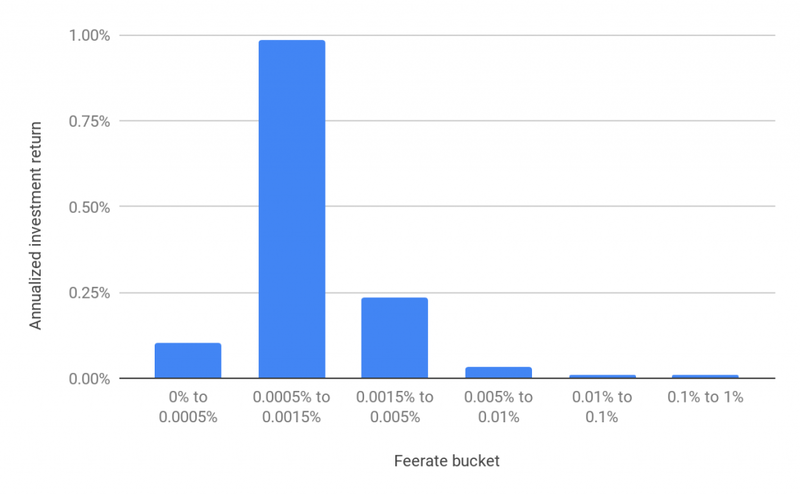 BitMEX Research decided to conduct a basic experiment to try and evaluate the state of the fee market, even in the Lightning network’s current nascent state. 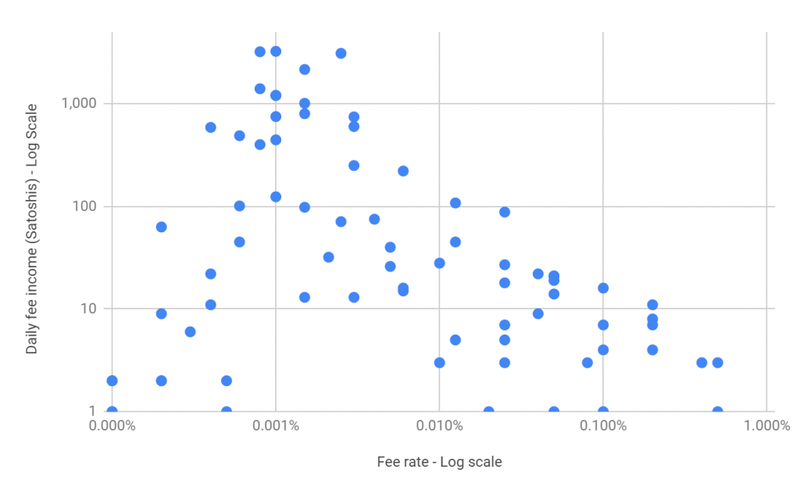 We set up a Lightning node and regularly changed the fee rate to attempt to determine which rates would maximise fee revenue, just as node operators may eventually be expected to do as the network scales. 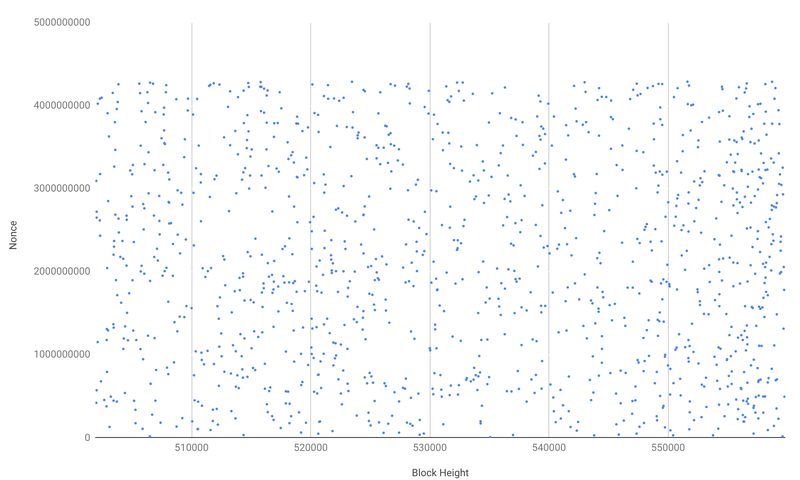 Our basic non-scientific analysis from one node is illustrated in the scatter chart below. It appears to indicate that fee rates do currently have an impact on a lighting node’s fee income. 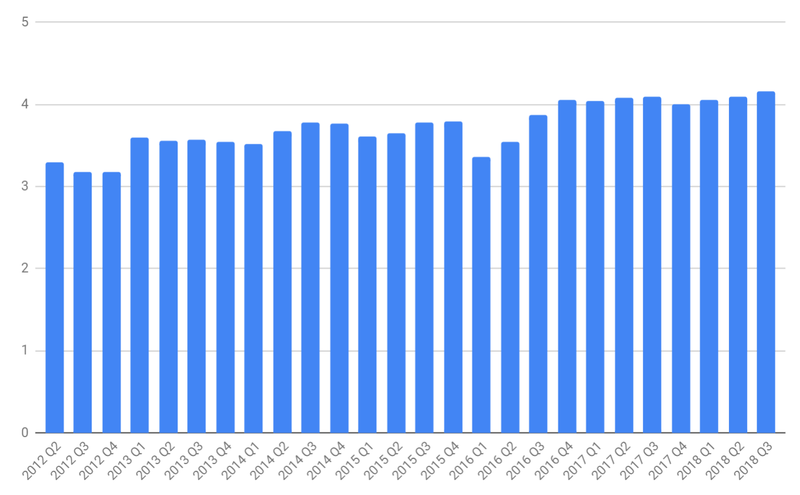 The daily fee income appears to quickly accelerate as one increases the fee rate from 0 till around 0.1 bps. Once the fee is increased above this rate, average daily fee income appears to gradually decline. Therefore, based on this experiment, it appears as if the revenue maximising fee rate is around 0.1 bps, which is certainly very low when compared to other payment systems. However, of course, this is only the fee for one hop, a payment may have multiple hops. 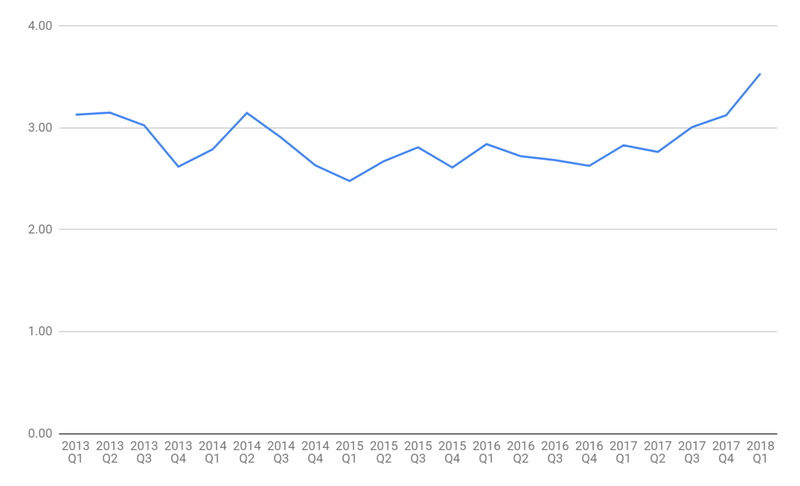 At the same time, the current Lightning fee market is barely exists, indeed BitMEX Research may be one in only a handful of Lightning nodes that has significantly experimented with economic revenue maximising behaviour by changing fees. Once the network scales and other parties try to maximise revenue, fee market conditions are likely to be very different. This exercise should therefore only be considered as an illustrative experiment, rather than anything particularly revealing about lighting fee markets. In addition to daily fee income, one can also consider the annualized investment return associated with running a lighting node and the various fee rates. This is calculated by annualising the daily fee income and dividing this number by the daily outbound liquidity. 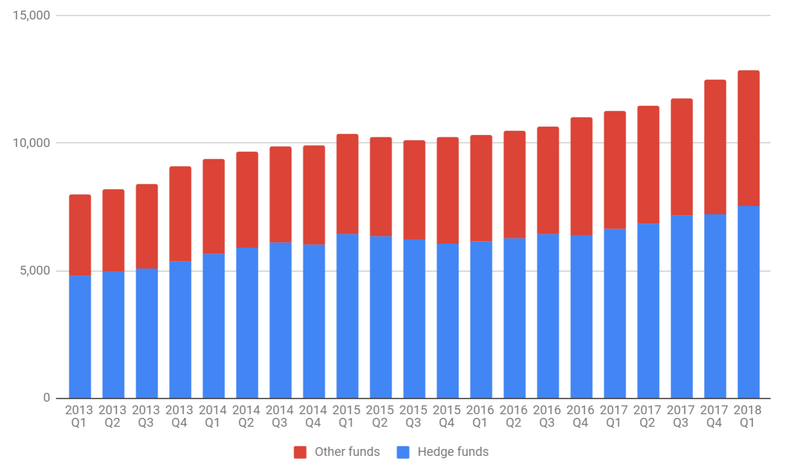 The highest annualised investment investment return achieved in the experiment was 2.75%, whilst the highest fee bucket investment return was almost 1%. This seems like a reasonably attractive return for what should in theory be a relatively low risk investment, at least once the ability to backup lighting channels in real time becomes implemented. Existing Bitcoin investors could be tempted by these returns and provide liquidity to the Lightning network, or alternatively US dollar based investors could buy Bitcoin, hedge the Bitcoin price exposure using leverage and then attempt to earn Lightning network fee income. Of course, liquidity providers in the current Lightning network are not likely to be motivated by investment returns. Current node operators are likely hobbyists, with the overwhelming majority of node operators making losses when considering the onchain fees required to open and rebalance Lightning channels. Although this hobbyist based liquidity probably can sustain the network for a while, in order to meet the ambitious scale many have for the Lightning network, investors will need to be attracted by the potential investment returns. A 1% investment yield may seem attractive in the current low yield environment, however the Lightning network may initially have difficulty attracting the right commercial liquidity providers. 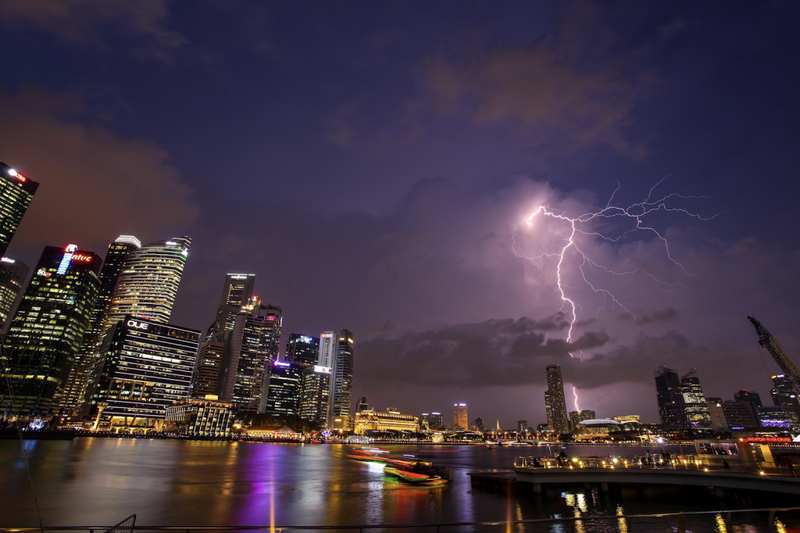 Investors in this space are typically looking for a high risk high return investment, which appears to be the opposite end of the spectrum for the relatively low risk low return investment on offer for Lightning liquidity providers. Therefore a new type of investor, one that fits this profile, may be needed. If the Lightning network reaches a large scale, it is possible that the highly liquid investment product, with stable low risk returns, is sensitive to economic conditions. Due to robust economic conditions and inflationary pressure, the federal reserve open market committee increase interest rates from 1% to 3%. However, if Lightning network liquidity is large enough for the above logic to apply, Lightning would have already been a tremendous success anyway. In some ways, if the Lightning network matures, one can even think of the investment returns from running a Lightning node as Bitcoin’s risk free rate of return, or at least a rate of return free from credit risk. 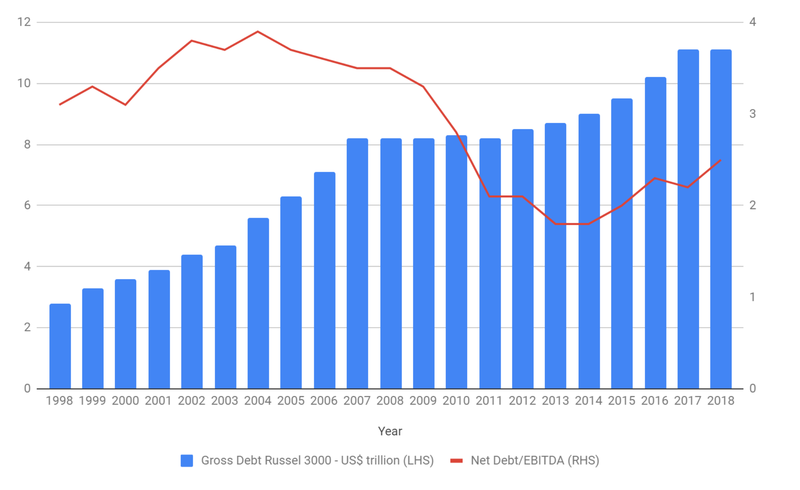 In traditional finance this is often the rate investors earn by holding government bonds, where the government has a legal obligation to pay the principal and coupon and a means to create new money to pay the holders of the bonds, such that the risks are near zero. 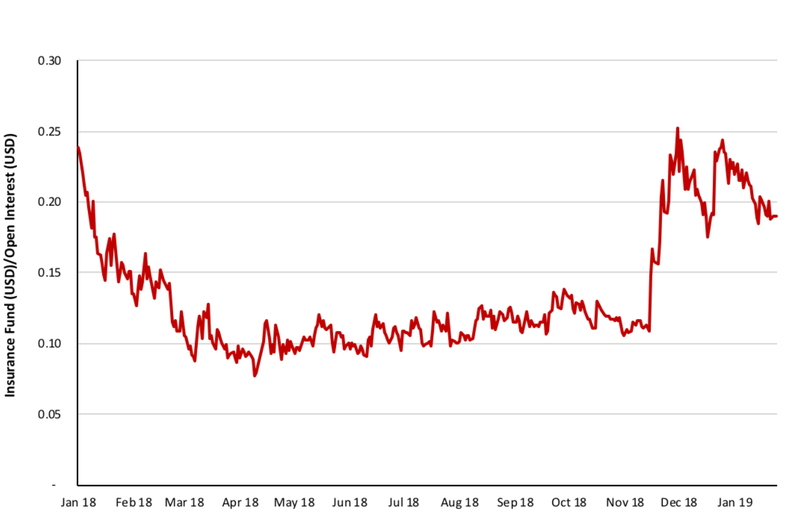 In theory, all other investment projects or loans in the economy should have a higher return than this risk free rate. The same could apply to Bitcoin, with Lightning node liquidity providers return rates being considered as the base rate within the Bitcoin ecosystem. 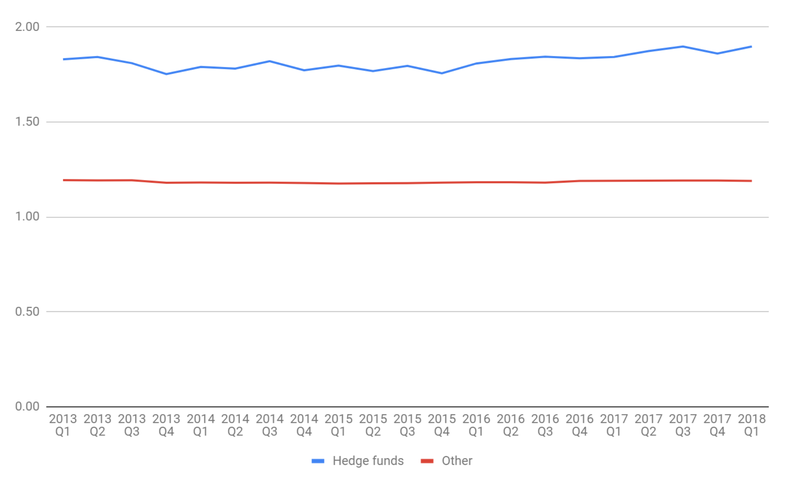 Whether specialist hedge funds and venture capital investors will have the same enthusiasm about becoming Lightning network liquidity providers, as they did for the “staking as a service” business model for proof of stake based systems in mid 2018 remains to be seen. While the investment returns for Lightning network liquidity providers do not yet look compelling, with the network in its formative stages, we do see potential merit in this business model. In our view, the Lightning network can easily scale to many multiples of Bitcoin’s current onchain transaction volume without encountering any economic fee market cycles or issues, all based purely on hobbyist liquidity providers. 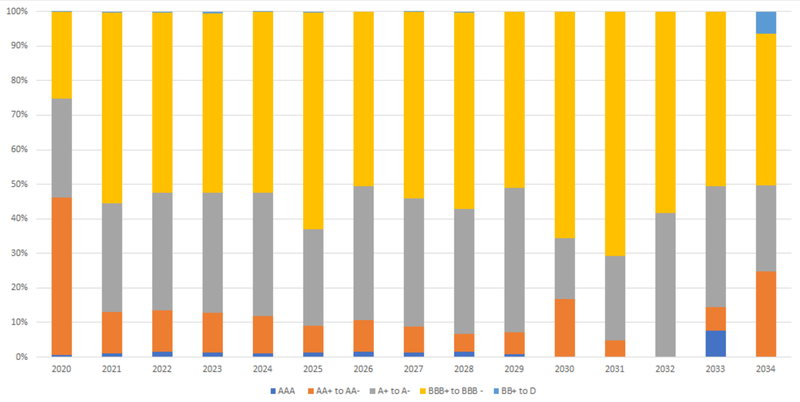 However, if the network is to reach the scale many Lightning advocates hope, it will need to attract liquidity from yield hungry investors seeking to maximise risk adjusted investment returns. Should that occur, unfortunately the network may experience significant changes in fee market conditions as the investment climate changes over time. However, it is relatively easy to set up a node, provide liquidity and try to earn fee income by undercutting your peers. 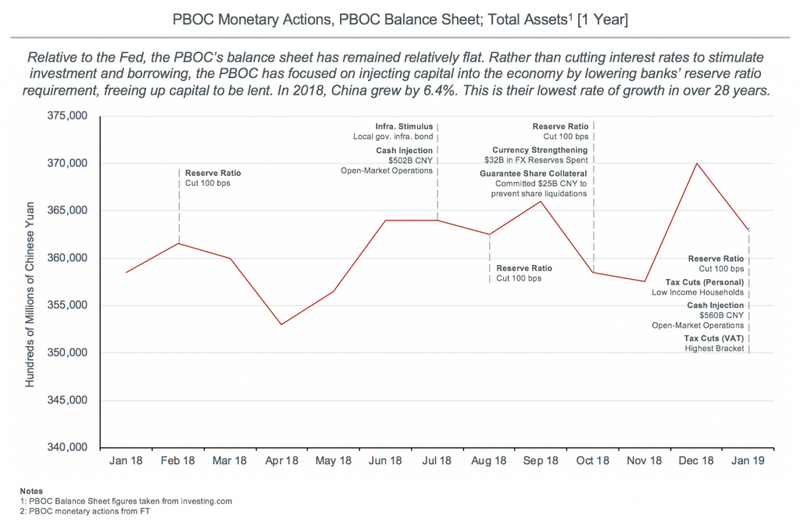 Where the balance is ultimately struck between the operational channels of running nodes, the extent of liquidity provision and the investment returns, we obviously do not know. However, if we are forced to guess, based on the architecture and design of the Lightning network, we would say the system is somewhat rigged towards users and low fees, rather than liquidity providers. Abstract: BitMEX Research is delighted to announce the launch of a new website to monitor the Ethereum network, Nodestats.org. The website connects to five different Ethereum nodes and collects data every five seconds. The main focus of the website is providing metrics related to the computational resources each Ethereum node requires. While analysing some of the metrics, we may have identified issues with respect to the integrity of the data reported by the nodes, which may be of concern to some Ethereum users. Nodestats.org was produced in collaboration with TokenAnalyst, who are BitMEX Research’s Ethereum network data and analysis partner. 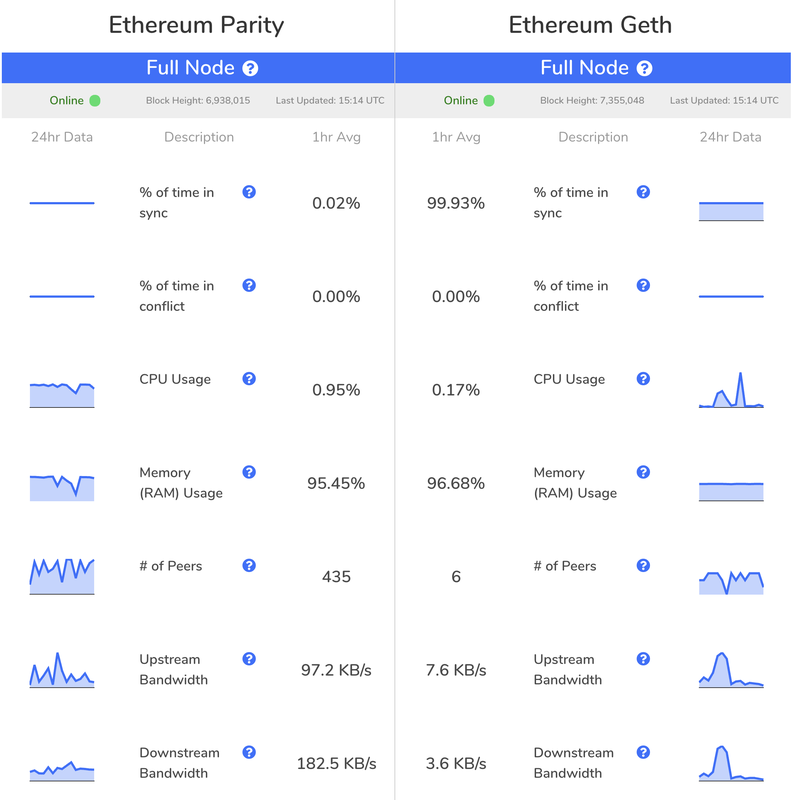 Nodestats.org compares the statistics of the two largest Ethereum node client implementations by overall adoption – Geth and Parity. Within these client implementations, Nodestats.org compares the performance of different node configurations – fast, full, and archive nodes. 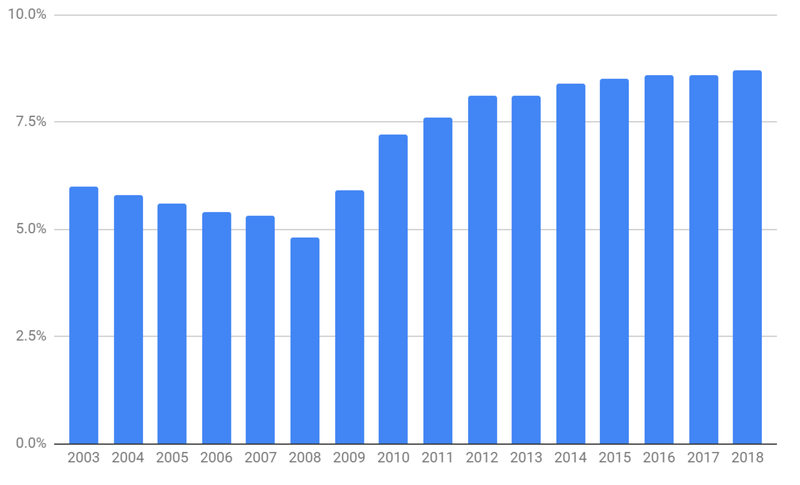 Nodestats.org began collecting data at the start of March 2019 and it is too early to draw any firm conclusions. However, we are saving the data and hope to analyse the long term trends at a later point. The Nodestats.org data is produced by querying our five Ethereum nodes or machines running the nodes, every five seconds (720 times per hour) and then storing the results in a database. 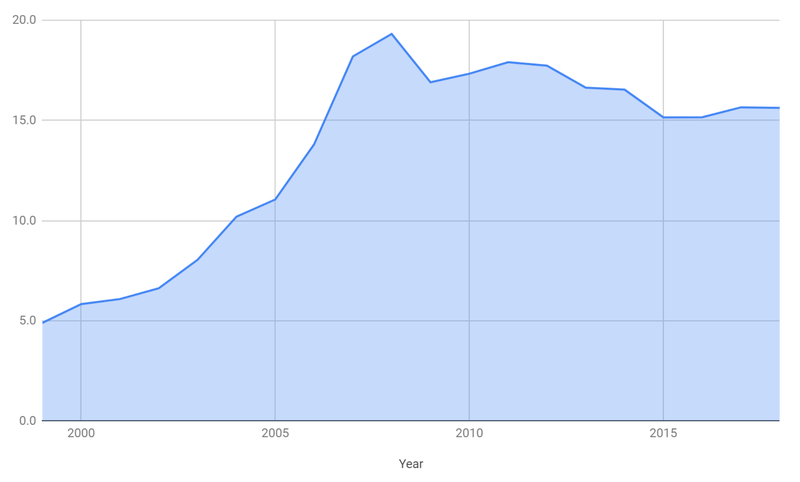 Various rolling averages and other metrics produced from this data, are displayed on the Nodestats.org website. % of time in sync This represents the percentage of time the node has verified and downloaded all the block data, up what the P2P network is informing the node is the chain tip. The hourly metric is calculated by determining if the node is at the tip every 5 seconds, which should be 720 queries per hour. The proportion of these queries where the node says it is at the tip is the reported metric. This field is based on the web3 “isSyncing” field, which we believe uses the highest block the node has seen, the “highestBlock” field, to determine if the node is behind what its peers regard as the highest block ever seen. Nodes typically report they are at the tip around 99.8% of the time, which means that in only around 1 of the 720 hourly queries are the nodes not at the chain tip. The only exception here is the Ethereum Parity full node, which we talk about later in this report. We believe the data integrity of this metric is poor, for instance in the case of the Parity full node the integrity of the information provided is weak, as we explain later in this report. Going forwards we aim to establish a more effective way of calculating this metric. % of time on conflicting chain This represents the percentage of time the node is following a different or conflicting chain to the node opposite it on the website. CPU Usage This represents the average percentage utilization of the machine’s CPU resources. All the machines Nodestats.org are using have the “Xeon(R) CPU E5-2686 @ 2.30GHz” processing unit with two cores. The exception to this is the archive node, which has 16 cores. All the nodes are using the AWS “i3.large” machines, with the exception of the archive node, which is running “i3.4xlarge”. Generally speaking, CPU usage tends to be between 0.01% and 1.0%. 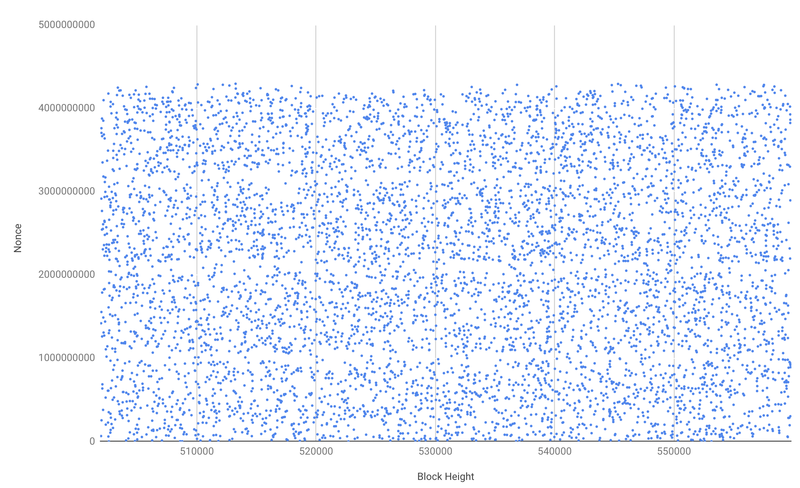 Parity tends to be towards the 1% level, while Geth appears to use less CPU power. Geth’s CPU usage appears less stable than Parity’s, with Geth’s CPU demand occasionally spiking to around the 1% level. Memory Usage Nodestats.org takes a reading from the machines every 5 seconds, related to how much memory is being utilized by the Ethereum client. All the machines Nodestats.org are using have 14GB of Ram, with the exception of the archive node, which is a 120GB of Ram machine. Generally speaking, however much RAM is available, the nodes use up the overwhelming majority of it (e.g. over 95%). The memory demands of the clients appear to be reasonably stable. Peer count The node provides Nodestats.org with the number of network peers, every 5 seconds. Parity tends to have around 450 peers, while Geth only has around 8. 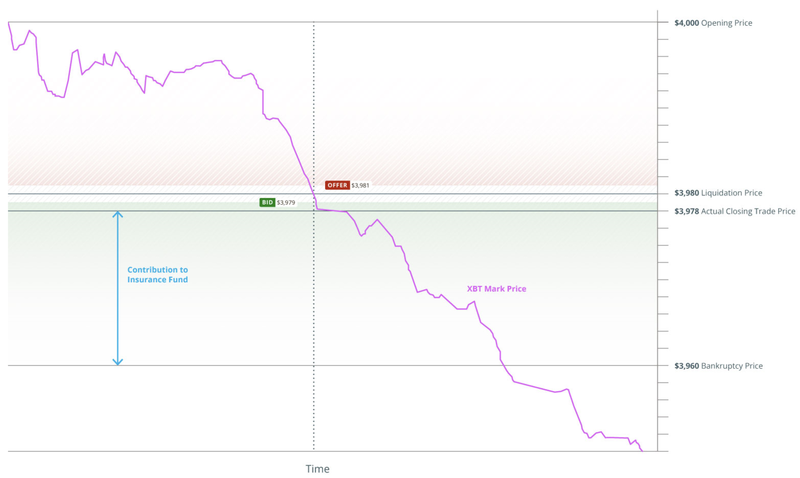 Geth’s peer count is more volatile than Parity, as it appears to occasionally fall to around 6. Upstream bandwidth Nodestats.org takes a reading from the machine every 5 seconds, related to the total network upstream bandwidth of the server. 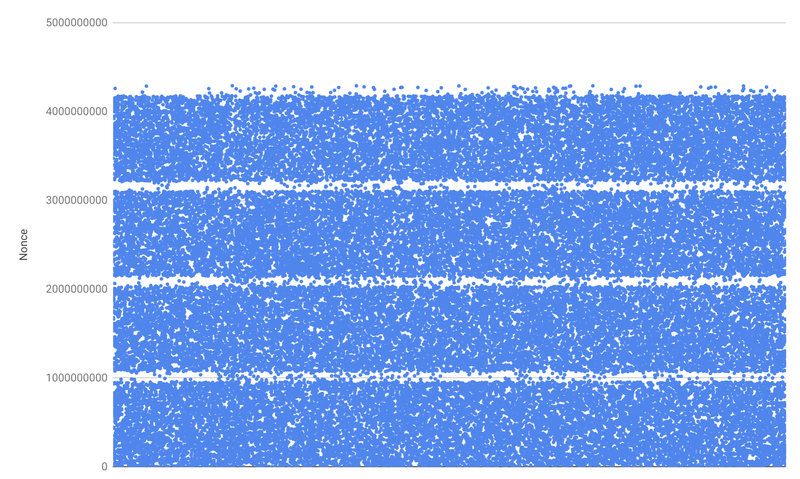 Parity, which has more peers, tends to use over 100KB/s of bandwidth (in each direction). 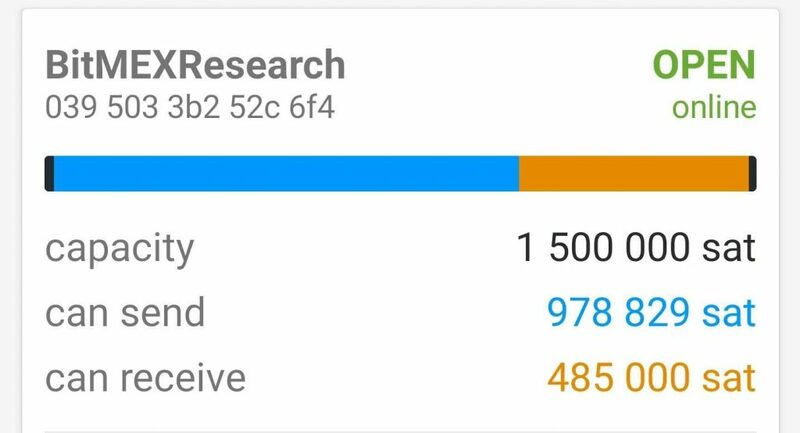 In contrast Geth tends to only use around 4KB/s of bandwidth. 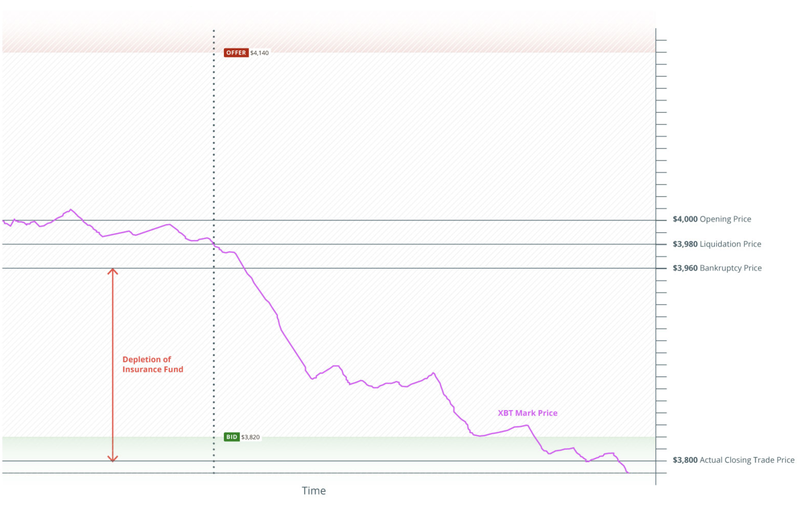 Geth’s bandwidth demand tends to be more volatile than Parity, with occasional spikes to around 60KB/s. Downstream bandwidth Nodestats.org takes a reading from the machine every 5 seconds, related to the total network downstream bandwidth of the server. Chain data size This metric represents the total data utilized by all the directories dedicated to the client. Unlike the other metrics, the disclosed figure is the absolute value, not a rolling 1 hour average. 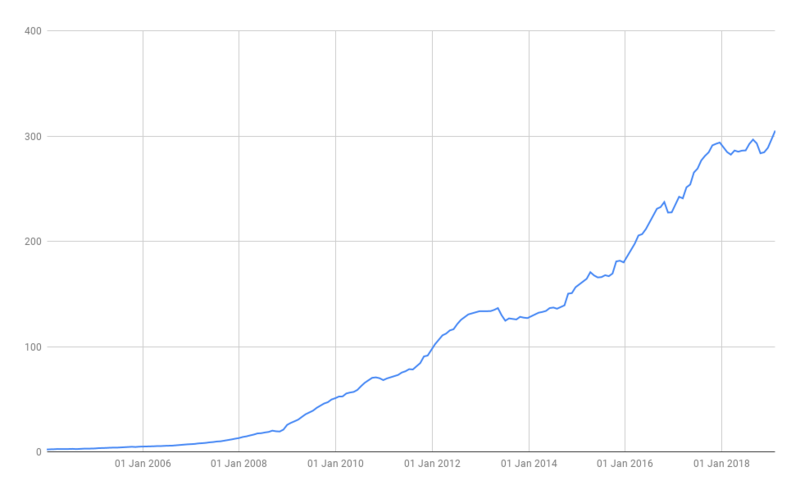 Currently, Parity requires around 180GB, Geth uses just under 200GB, and the full archive node uses up 2.36TB of data. The Parity full node was started on 1 March 2019, at the time of writing (12 March 2019) it has still not fully synced with the Ethereum chain. The client is around 450,000 blocks behind, and based on its current trajectory, it should catch up with the main chain tip in a few days. Due to the slow initial sync, the “% of time in sync” metric is shown as near 0%, as the client is never in sync. The fact that a machine with the above specification takes over 12 days to sync may indicate that it is the initial sync issues could be a greater concern for the Ethereum network than post sync issues, such as block propagation. While the slow initial sync is a potential problem, at least for this system setup, Ethereum has not yet reached a point where the node cannot catch up, as the sync is faster than the rate of blockchain growth. 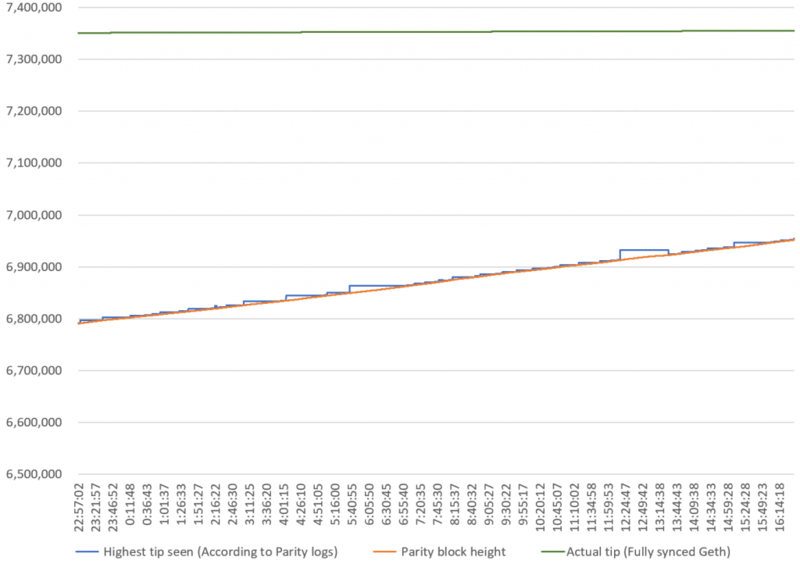 The Parity full node also sometimes reports that it is in sync, despite being several hundred thousand blocks behind the chain tip. For instance in the screenshot at the start of this piece, the website reports that the node is fully synced 0.02% of the time, indicating the node falsely thought it was at the tip for some periods of time. 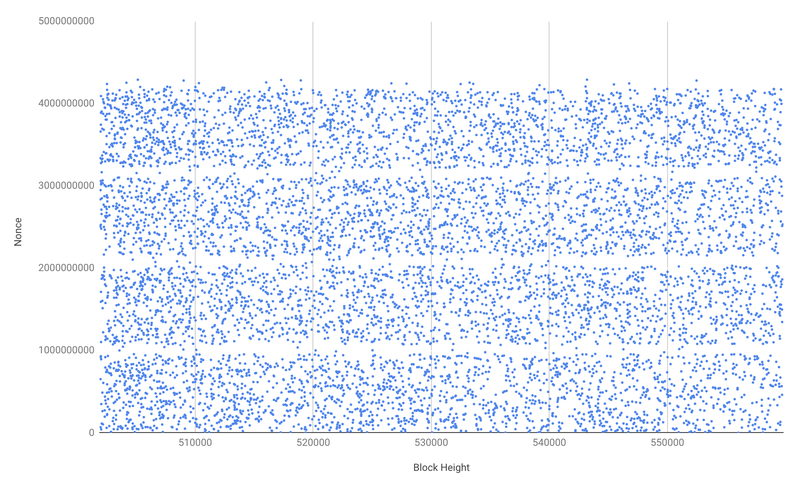 As the chart generated from the Parity full node logs below illustrates, the highest block seen on the network figure, in blue, appears potentially incorrect. The highest block number seen on the network figure, sometimes falls in value as time progresses and has remained consistently well behind the actual chain tip (shown in green). On occasion this potentially buggy figure fell towards the height of the verified chain (orange) and our website incorrectly reports the node as in sync. This may be of concern to some Ethereum users, since the Parity full node has many connections to the network, therefore this may be a bug. This potential bug could undermine this whole metric for our website, even for the other nodes, as the highest tip seen field may not function appropriately and our figures may be inaccurate. 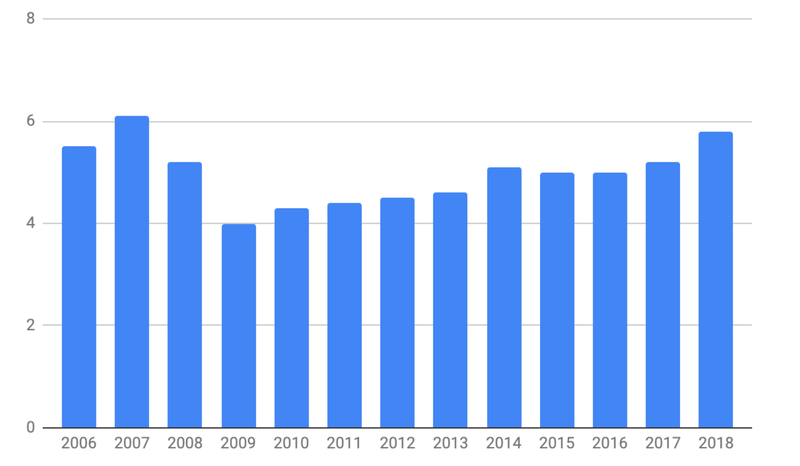 However, we continue to include this metric, since the Nodestats.org website displays the data reported by the nodes, regardless of our view on the integrity of the data. We may look to implement our own improved metric in the future. One could argue the impact of this potential bug could be severe in some limited circumstances, if exploited by an attacker in the right way. For example a user could accept an incoming payment or smart contract execution as verified, while their node claims to be at the network chain tip. However, the client may not really be at the chain tip and an attacker could exploit this to trick the recipient into delivering a good or service. The attacker would need to double spend at a height the vulnerable node wrongly thought was the chain tip, which could have a lower proof of work requirement than the main chain tip. Although successful execution of this attack is highly unlikely and users are not likely to be using the highest seen block feature anyway. For now, Nodestats.org provides a useful tool to assess the approximate system requirements for running Ethereum nodes. At at a very basic level, it also provides mechanisms to assess the reliability of the Ethereum network and its various software implementations. However, we accept that the “% of time in sync” metric may not be reliable, but it does highlight a potential issue.